Family has become more and more precious to me through the years. When I was raising my daughter I was so caught up with working outside the home and the ministry that I did not spend a great deal of “quality” time with Heather. I have looked back at those years with deep regret, but I have also released that regret to the Lord. Instead, I have used my experiences to help guide other mothers in their biblical responsibilities to their family. 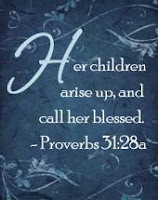 It is our responsibility as women to teach other women, especially our daughters, to be godly influences in our home as well as in all of life. There is an old Amish saying, “Ve get too soon olt, and too late smart.” (No those are not typos). How sad and true. I have learned to stop and enjoy the “little” moments in life. What may seem little and insignificant to us, may big moments to others. This past weekend Heather called to asked if I wanted to go to the dollar store with her. My first thought was, no, I am so tired, my feet and legs are hurting and swollen, but I could hear in her voice the excitement that she wanted to go out and spend time with her mother. So, she loaded the wheelchair in the van and off we went to spend time together. We were only gone about 45 minutes, but to Heather, who loves to shop; this was quality time with her mother. This was a “big” moment to her. Another “little” moment turned “big” moment was Sunday evening. Travis, my 13 year old grandson, loves to play games. Not just video games as most teenagers, but any kind of family games. Heather and her family came over just to spend some time with us. As we were sitting around talking, we decided each us would take turns naming and spelling in alphabetical order all the states of America. Travis would get such a kick when his PhD/teacher grandpa was stuck on the spelling of Massachusetts. We encouraged and applauded one another as we would get an answer correct. We enjoyed this game so much that next weekend it will be the capitals of all the states. Now that will be difficult! What is the “big” moment? T-I-M-E. What we have is the present. We cannot bring back time nor can we borrow time. What we as parents have to give is now, this moment. It may be insignificantly “little” to us, but it is incredibly “big” to our children. It does not have to be a great amount of time either. What is important is the quality of the time you give. These are the moments that our children will remember for a lifetime. To get all there is out of living, we must employ our time wisely, never being in too much of a hurry to stop and sip life, but never losing our sense of the enormous value of a minute. No is the only time there is. Make your now wow, your minutes miracles, and your days pay. Your life will have been magnificently lived and invested, and when you die you will have made a difference. Amen, time is so precious. I liked your time quotes... and I need them very much. As I anticpate less time with my boys after being home full time for the past 12 years I know I am going to have to manage it well. I am SO glad for the past 12 years and a little afraid of losing ANY of it now. But hopefully it will only be a few hours a week. Thanks for this post. Soooo true, Michele! Loved the Amish quote. I laughed so hard when I realized I wrote 2208!!!!!! So true. Logan is only 8, but already I feel like the time is flying by. We are going to a baseball game tonight together. Just me and him. I've discovered that with a daughter ( at least for me) the time thing seems to come more naturally. She enjoys the same things as me, likes to be in the kitchen, likes to be artsy, likes to shop, etc...but with my son, I have to do more things to really MAKE the time and spend time that means something to him. Time gets away from us so quickly.. so I pray that God multiply what time we have, giving us excess time to spend inHis presence as well! Thanks for visiting my life and drop by anytime! Time in a bottle...just like Missy said. That's the song that was going through my head as I read this post. We should never kill time, but rather make time. I love that last quote... What we love to do we make time to do. So, if we love to be with our family, we will make time. If we love to spend time in His Word, we will make time. Excellent post my sentimental sister.